MCE Technologies Installs Connected Vehicle Infrastructure - Motor City Electric Co.
We have been hearing more and more news about Autonomous Vehicles (AVs), but another area of rapid growth and interest is Connected Vehicles (CVs). This technology enables vehicles, roads and other infrastructure, smartphones, and other devices to “talk” to one another. This is possible due to in‑vehicle or aftermarket devices that continuously share important safety and mobility information. Connected vehicles could dramatically reduce the number of fatalities and serious injuries caused by accidents on our roads and highways. The number of people surviving crashes has increased significantly thanks to airbags, anti-lock brakes, and other technology. Now the U.S. Department of Transportation (USDOT) is shifting its focus from helping people survive crashes to preventing crashes from happening in the first place. 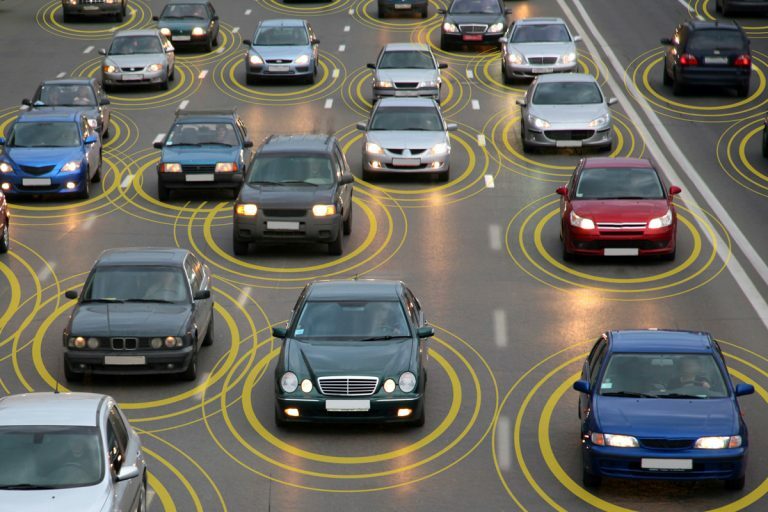 In addition to the safety potential of connected vehicles, they also promise to increase transportation options and reduce travel times. Intelligent traffic control systems help us by reducing the time we spend stopped at red lights or waiting on freeways when an accident occurs. Automatic toll collection moves vehicles more quickly through toll booths, reducing congestion and pollution. Traveler information systems help us by giving us current, multi-modal information on travel conditions allowing us to make smarter choices about how, when, and where to travel. In-vehicle systems will help us by giving us in-vehicle maps, guiding us to our destination and improving our safety by automatically notifying emergency services when a serious accident occurs and exactly where the accident is located. Advanced transit systems help transit agencies operate more efficiently and provide travelers with real time information that makes using transit easier and more attractive. Intelligent commercial vehicle systems will help commercial vehicle operators process the paperwork associated with moving goods. These systems will also help public agencies improve safety by inspecting the vehicles that need it the most. For the new project, MCET is installing hundreds of Roadside Units (RSUs) and numerous Wi-Fi vehicle detectors at more than 100 MDOT locations. They are also installing equipment and wiring back to the traffic signal cabinet to help facilitate traffic flow. 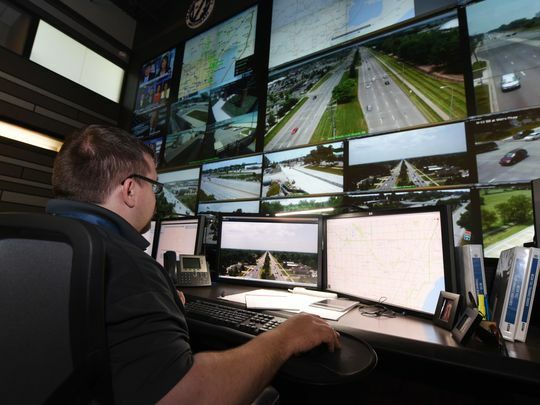 MCET will integrate the RSU devices using the existing Macomb County wireless communications network to connect to MDOT’s Data Use Analysis and Processing (DUAP) program and Macomb County’s Communications and Technology Center (COMTEC) in Mount Clemens. Geometric Intersection Description (GID)/MAP files with Signal Phase and Timing (SPaT) data will also be generated, processed, installed, and integrated onto the RSUs. Macomb County’s 25,000 square foot state-of-the-art Communications and Technology Center in Mount Clemens that opened in December 2013. The $13.5-million COMTEC provides 24/7 situational awareness for residents, businesses, and first responders. These situations can include routine traffic accidents, fire or EMS calls for service, road closures, or an escalating emergency event such as severe weather. The facility houses the Macomb County Sheriff’s Office Centralized Dispatch, the Road Department Traffic Operations Center, the Information Technology Department and Data Center, and the Emergency Management & Communications Department. Placing all of these operation centers into one location allows COMTEC to maximize resources and improve services. DSRC DSRC is “a two-way short-to-medium-range wireless communications capability that permits very high data transmission critical in communications-based active safety applications.” The Federal Communications Commission (FCC) set aside 75 MHz of spectrum around the 5.9 GHz band in 1999 to be used for vehicle-related safety and mobility systems. DSRC will be used for both vehicle-to-vehicle communications as well as vehicle-to-infrastructure communications. The spectrum is seen as particularly useful for V2x communications because it can support very low-latency, secure transmissions; fast network acquisition and in general, the ability to handle rapid and frequent handovers that are inherent in a vehicle environment; as well as being highly robust in adverse weather conditions. The DOT has identified more than 40 use cases for V2I technologies, such as the ability to pay for parking and tolls wirelessly, identifying when a car is approaching a curve too quickly and alerting the driver, adjusting traffic signals to accommodate first responders in an emergency, and alerting drivers of conditions such as road construction. DUAP The Data Use Analysis and Processing (DUAP) program is an MDOT initiative that investigates how collected data can be used to increase the efficiency in the way the agency manages and operates itself. The DUAP program will develop a system that integrates data from connected vehicle (CV) and mobile and fixed data sources, and analyze the data to determine traffic, weather, and asset conditions. GID Geographic Intersection Description is a component of Communication-Based Intersection Safety, and provides geospatial encoding and reference points of an intersection. This information is used by the program to pinpoint locations. 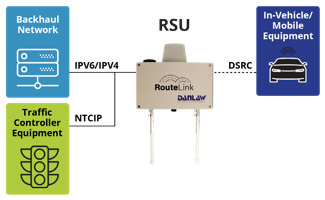 RSU These units communicate between in-vehicle/mobile devices and transportation infrastructure, such as traffic controller equipment and backhaul networks. As the central member in the DSRC system, the RSU applications focus on safety and congestion management, like alerting drivers of impending traffic issues or adverse road conditions, enabling pre‑emption for first responders, or priority for buses and service vehicles. RSUs provide data to remote hosts, while broadcasting and receiving DSRC messages to mobile equipment. This includes SRM, SSM, SPaT (see below), MAP and RTCM messages as well as traveler information messages, roadside alerts, and WSA broadcasts. Locally, connections are provided for traffic controller equipment to be integrated in the system. Additionally, an RSU can convert Basic Safety Messages (BSMs) broadcast by approaching vehicles to Wi-Fi messages. Mobile devices (smartphones) carried by pedestrians would receive these messages computing the probability of a collision, based on the pedestrian’s current location and walking speed! SPaT Signal Phase and Timing information can be provided to vehicles approaching signalized intersections to enhance safety and mobility. SPaT works by equipping each signalized intersection with a DSRC (see above) wireless transceiver that can broadcast information very dependably and with low latency. 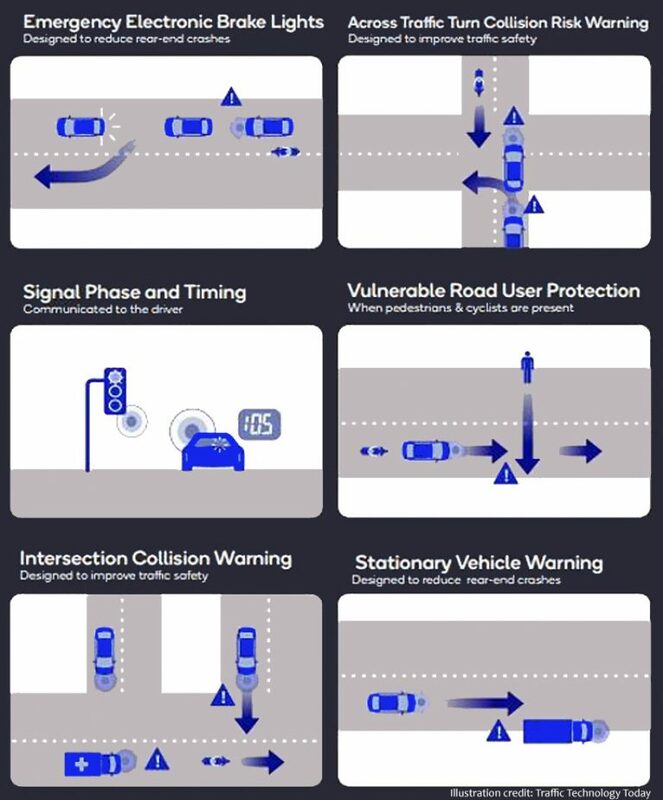 Safety applications for SPaT include CICAS-V (signal violation warning), CICAS-TSA (traffic signal adaptation, extending all-red), signal status display in vehicle, vulnerable road user (pedestrians, bikes) warnings near intersections, truck signal change warning, and alerting drivers about imminent emergency vehicle pre-emption. Interesting to note: CICAS-V can estimate the risk that the vehicle will violate a traffic light. If the is risk is sufficiently high, CICAS-V provides a signal to the driver! 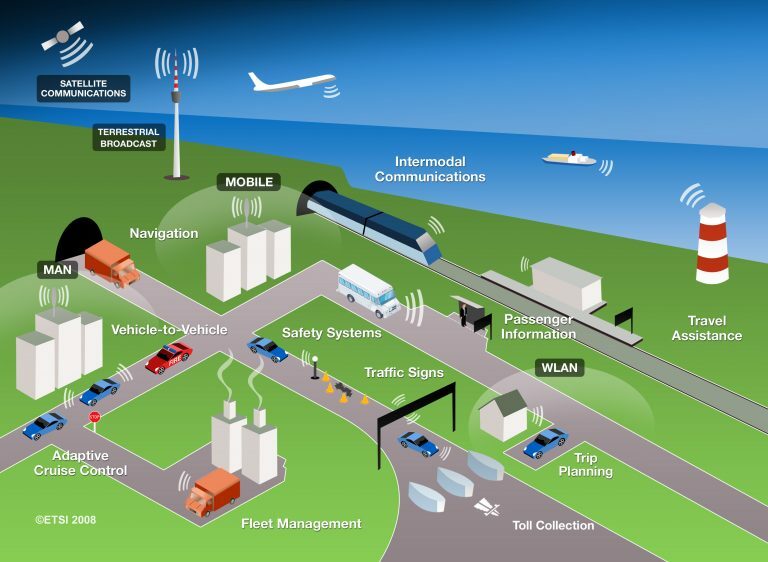 Mobility applications include transit signal priority, arterial truck driving support, eco-driving support, traffic signal control optimization, and “All-User” optimization of traffic control. V2x Shorthand for vehicle communications such as vehicle-to-infrastructure (V2I) or Vehicle-to-Vehicle (V2V). Wi-Fi Vehicle Detectors These ITS sensors provide continuous scanning at intersections to collect traffic congestion data. Utilizing Wi-Fi, the sensors sample data such as origin-destination and travel times at a rate of 30%-55%, and collect up to 250,000 records per hour. The technology provides traffic information at over 95% accuracy in real time. Unlike Bluetooth, which relies on an interrogation and response for collecting data, Wi-Fi is completely passive meaning that the sensor only listens. Passive data collection eliminates the possibility of interference with other 2.4Ghz equipment such as wireless radios or other access points. Media Access Control (MAC), a unique identifier, address hashing is employed to maintain privacy.